Update as of 4:20 p.m. Oct. 2: An apology has not been directed personally to Edwin Frommelt. His wife Amanda Lynn Delorme told Windspeaker.com the only thing that has been done is the statement that Quality Foods issued on their Facebook.page. "No one has attempted to contact him directly to address what has happened." She called it disheartening and disappointing. 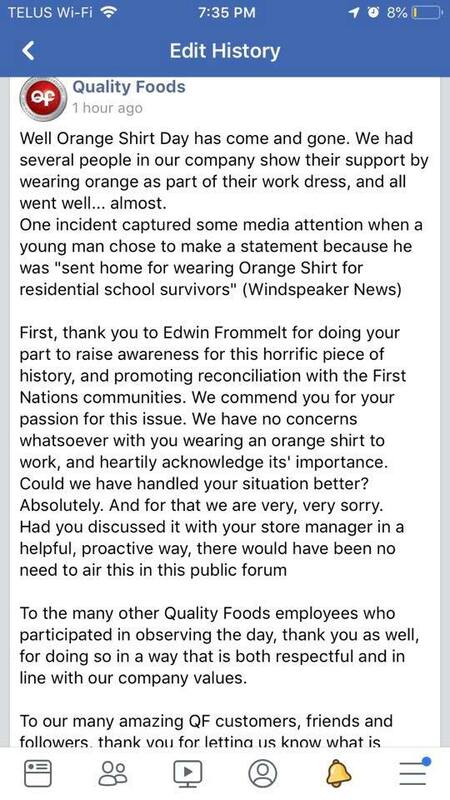 Quality Foods was learning on the fly yesterday after it posted a Facebook apology to employee Edwin Frommelt for not allowing him to wear his orange shirt at work on Sept. 30—Orange Shirt Day—commemorated across the country to honor residential school survivors. The apology came after Frommelt went public with a complaint to Windspeaker.com about the employer’s response to his orange shirt, telling him to change or go home. The article was published yesterday. “One incident captured some media attention when a young man chose to make a statement because he was "sent home for wearing Orange Shirt for residential school survivors" (Windspeaker News). The post went on to thank Frommelt “for doing your part to raise awareness for this horrific piece of history, and promoting reconciliation with the First Nations communities. We commend you for your passion for this issue. But this was an edited apology after many followers rebuked the company for a first attempt. “**Edited in response to comments we received that brought more valid points to our attention. **,” the company wrote in the post. One part of the original statement made people wonder about the company’s sincerity. “Had you discussed it with your store manager in a helpful, proactive way, there would have been no need to air this in this public forum” was the offending comment, which was described as victim shaming, by some. “Omg Quality Foods you almost had me with your apology but to cover up the dig you made on your employee (and the fact that you made the dig at all,” wrote one person in the comments section after Aleicia Vee posted a captured screenshot of the first apology attempt. “Wow passive aggressive very sad,” wrote Jackie Jack. “Really? You’re going to in a public statement slam your employee... Thanks for your non apology,” wrote Tamara Rose. “I was glad to see an apology and then I saw a sentence where the victim was blamed. I think the entire chain should have an orange shirt day, as well as a staff meeting for all explaining the importance of their support…,” wrote Rita DeLongchamp-Osborne. To end the final version of the apology, Quality Foods thanked “everyone that has taken the time today to help us learn and grow by sharing their comments and feedback. We have some learning to do, it’s clear. "As many of you know, yesterday was Orange Shirt Day, in recognition of residential school survivors. We had several people in our company show their support by wearing orange as part of their work dress, and all went well... almost. First, thank you to Edwin Frommelt for doing your part to raise awareness for this horrific piece of history, and promoting reconciliation with the First Nations communities. We commend you for your passion for this issue. We have no concerns whatsoever with you wearing an orange shirt to work, and heartily acknowledge its' importance. Could we have handled your situation better? Absolutely. And for that we are very, very sorry. To the many other Quality Foods employees who participated in observing the day, thank you as well, for doing so in a way that is both respectful and in line with our company values. To our many amazing QF customers, friends and followers, thank you for letting us know what is acceptable to you and what is not. Wearing supporting colours/accessories in the workplace is a fairly recent phenomenon, and we'll be sure to address this going forward in a way that everyone involved is clear on what's appropriate to avoid these types of situations in the future. Thank you to everyone that has taken the time today to help us learn and grow by sharing their comments and feedback. We have some learning to do, it's clear. Please know that we are listening, and we will do better. We promise."